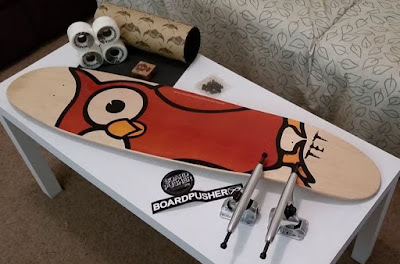 Recently I decided to purchase an Alvin Owl Longboard complete because a) I've never tried longboarding and b) I thought it would be great for you to see pictures of an actual complete deck purchased through etourist Skateboards. When buying a complete you can choose from a small range of branded trucks and wheels. I chose the cheapest options because, whilst I get to buy my own decks at wholesale prices, that discount is dwarfed by the postage cost from the USA to Australia. It's not prohibitively expensive but, it would be significantly cheaper if I just bought the deck and then sourced everything else from an Australian based Skate shop on ebay. 1x Good Quality Grip tape (enough to cover whole board). 2x Luxe 180mm/50 degree polished trucks. 1x A4 page Popsicle deck design template. If you want to pay a little extra Boardpusher will assemble your deck for you. I opted to assemble it myself because that's just a part of the new skateboard (bonding) experience. Shipping times from the USA to Australia were pretty good. I ordered my set up on October 28. It arrived on November 7. My first ride on my Alvin Owl Complete Longboard. Whilst buying a complete deck is purely optional, the quality of the components you get are professional standard. It's well worth the investment. However if you don't want to spend quite that much buying just the design you want on your preferred deck shape is a great option - especially if you already have the rest of the hardware on a deck you're thinking of retiring. Purchase your Alvin Owl Longboard, Complete Skateboard from etouristSkateboards. Buy Now.